BlackBerry Bling - Diamond Encrusted Pearl | BlackBerry Blast! If you've got a cool $88,000 to spare you can purchase a diamond encrusted BlackBerry (or other gadget) for your collection. A company called Amosu, is famous for creating extreme jewelry-editions of consumer electronics with gold and diamonds. Their latest blinged out gadget is the Blackberry Pearl Diamond Edition. 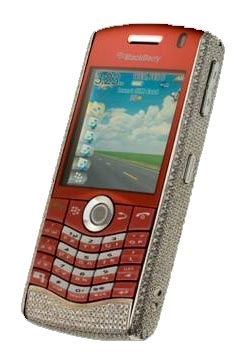 If you purchase the BlackBerry Pearl Diamond edition you get a BlackBerry encrusted with 900 diamonds. You also get concierge service allowing you access to a high class events and services. The diamonds are fully recyclable, so when you decide to upgrade your handset you can have the diamonds recast on your new phone. Check out Amosu's web site at the link below. If you want a diamond encrusted iPhone, they have that too.